The question: Do I do things other than crosses? Answer: Yes! I chose 2 woods from the Jewish scriptures. 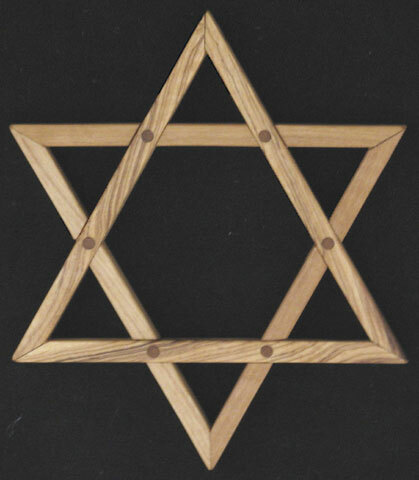 The Star of David is made of olive wood. One triangle is made of the sapwood (plain) while the second triangle is made from the heartwood of the olive tree (marbled grain). 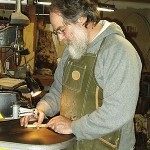 The 12 pegs are turned from Cedar of Lebanon; the wood used by King Solomon to build the Temple in Jerusalem. The challenge was the complex joinery is this relatively simple symbol of faith. 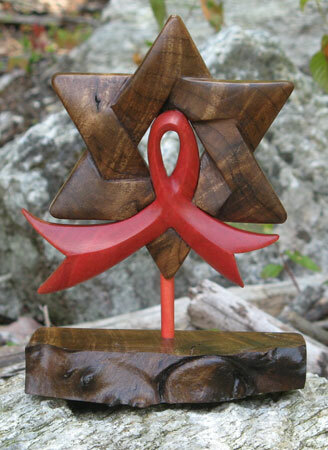 A choir commissioned this Star of David and Pink Ribbon as a gift to be given their beloved director as she began a new round of breast cancer therapy. 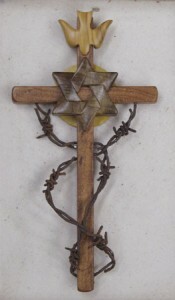 The Star of David is made from a myrtle burl from north of Jerusalem. The ribbon is an exceptional piece of wood called Pink Ivory. 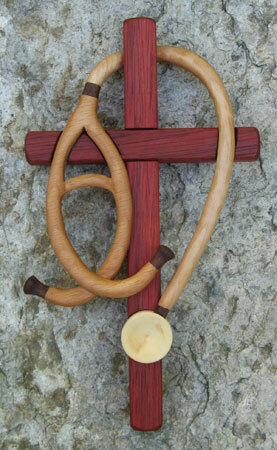 The request was to design a cross with a stethoscope being ‘worn’ on the cross much like a doctor would wear the stethoscope. This was designed to celebrate how a person would listen to both the heart and the soul. He always sang ‘you are my sunshine’ for his wife. 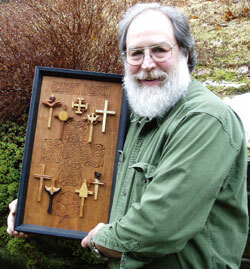 After he died, their daughter asked me to make a cross for her mother celebrating his life and their marriage. 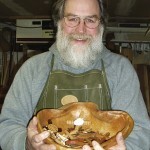 Apple wood is thought to have the essence of love and healing within it. 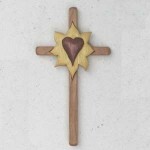 The sun is made of a yellow wood called Pau amerillo. This spiral honors and celebrates the hope of God/Allah/Yehaweh as expressed through the Christian, Jewish and Islamic faith traditions. 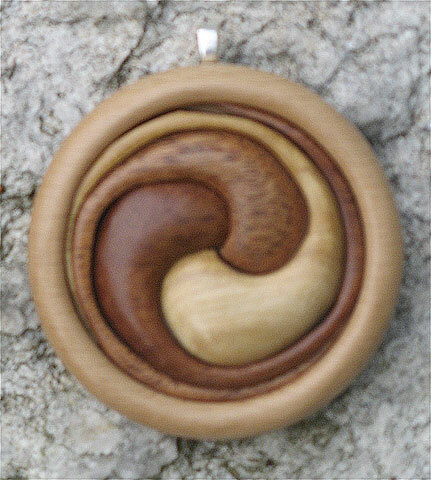 The ‘three coil’ spiral is an image that expresses the vision of faith that each of the three scriptures articulate. Each coil is distinctive even as it is ‘held’ by the other two. The three woods are distinct species (humilis, mahagoni, macrophyllia) from the Sweitenia family of wood. 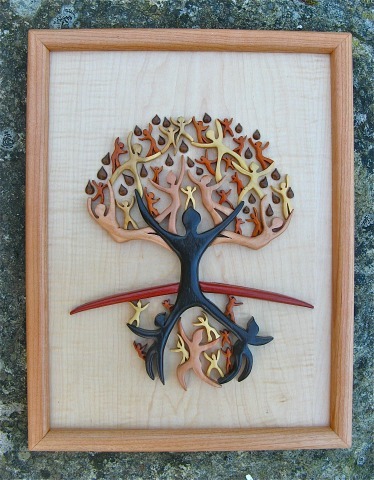 This is a rendition of the image associated with the Unitarian Universalist Church was created for the Andover Newton Theological School bookstore. 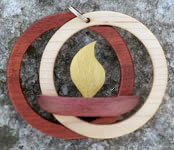 The two rings are made of Maple and Satine. The chalice is made of Purpleheart. The flame is Pau amarello.